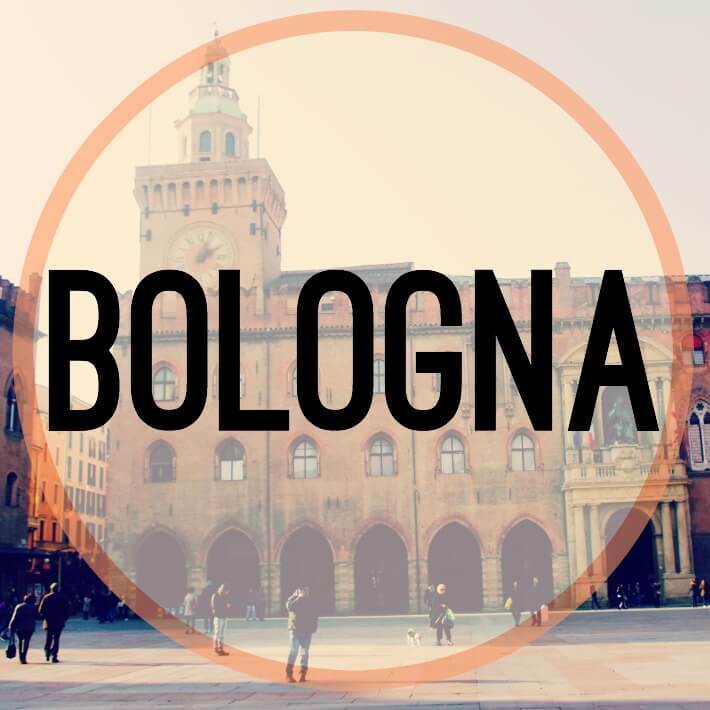 Situated in the Emilia-Romagna region of Northern Italy, bustling Bologna is the perfect destination for a food filled, picture perfect weekend away. 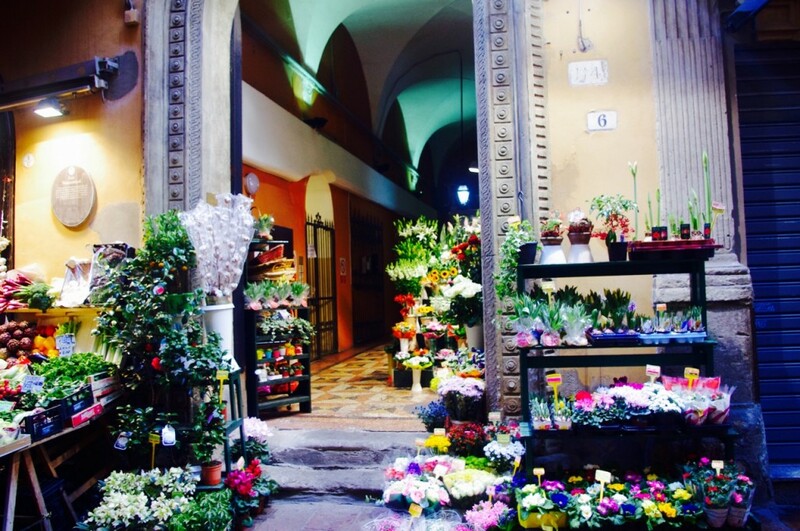 From terracotta tiles to plentiful porticoes; for a couple of days of ambling and aperitivo there’s no better backdrop. After checking into Hotel Touring and swiftly caffeinating up for the day ahead, we set out with minimal agenda to explore the city. 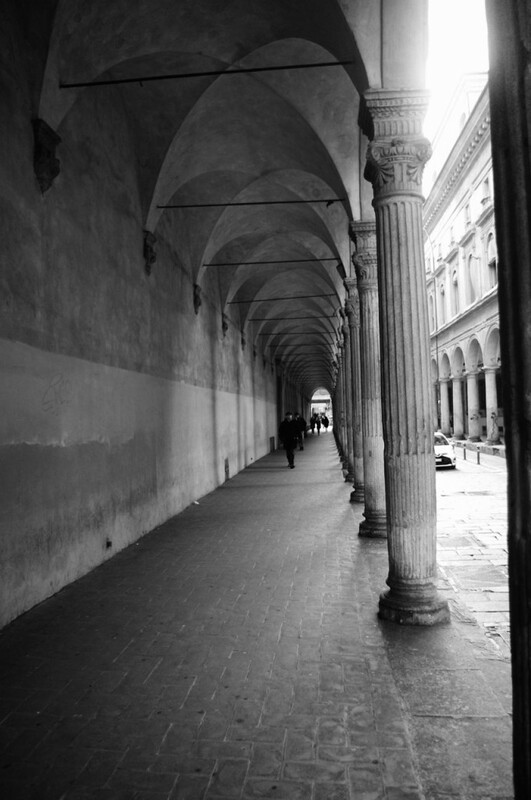 Immediately we’re struck by the porticoes that cover seemingly every stretch of pavement with their ornate columns. 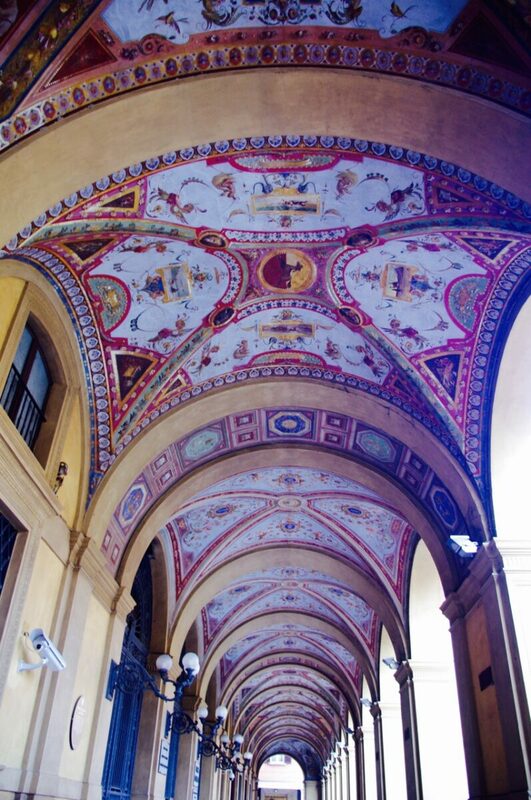 This is a feat of architectural genius as well as beauty; come rain or shine there’s no excuse not to go outside…and shop…and eat. 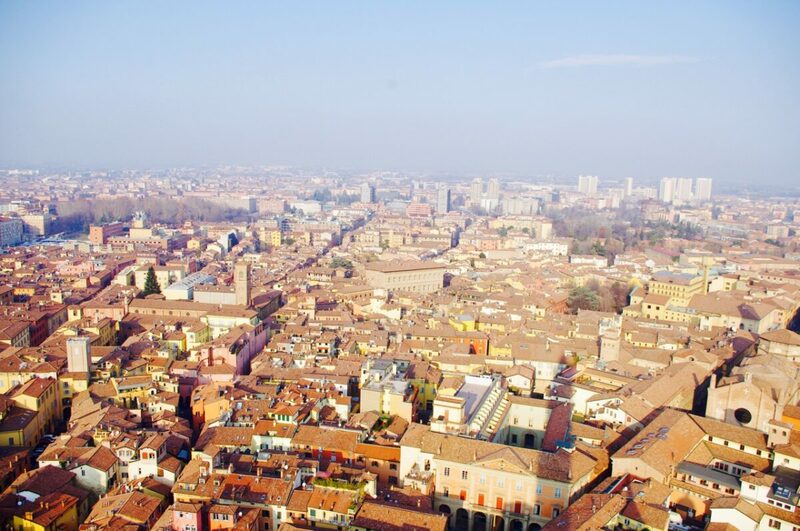 Both of which there are ample opportunities to do in Bologna. An abundance of designer shops suggest an affluent community (or at least one who get as much enjoyment from window shopping in front of such establishments as I do). 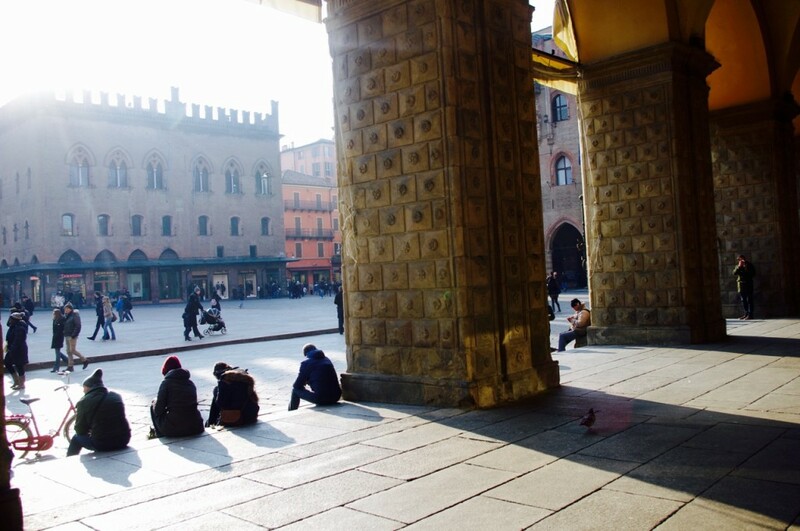 The Central Piazza Maggiore is home to several iconic Bologna landmarks including the Fountain Of Neptune and the Basillica of San Petronio. We enjoyed traditional piadinas (folded flat breads) from a nearby shop filled with fresh pesto and peppers while watching the lunchtime world go by from the comfort of the square’s steps. 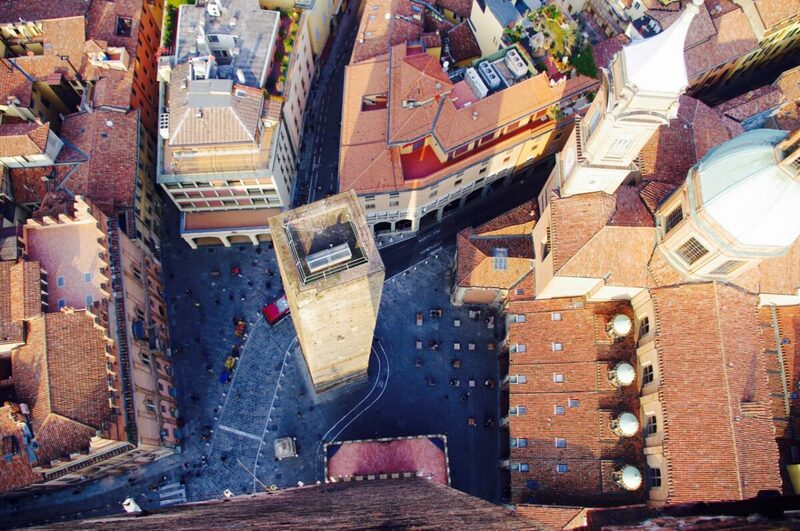 Just off from the Piazza lie Bologna’s famous two towers. Both of which lean, albeit slightly less famously than their Pisa counterpart. 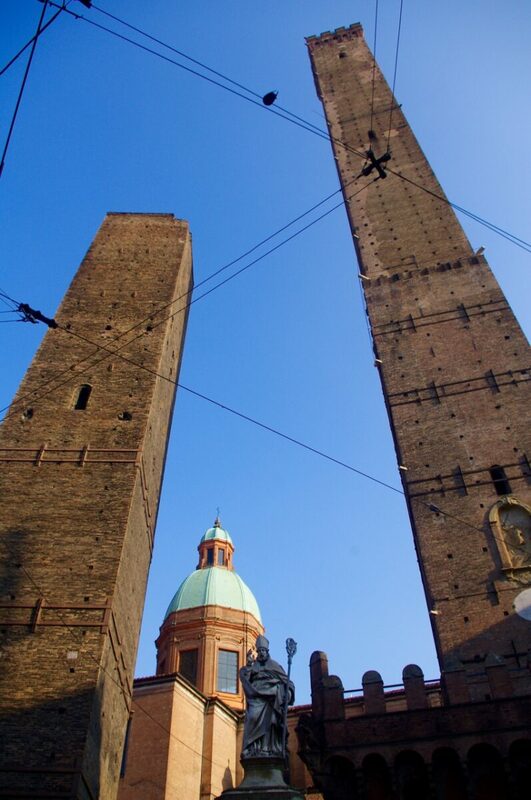 The taller of the two, Asinelli, is open to the vertigo braving public for €3. After paying said €3 you’re treated to a 498 step climb up some of the most questionable steps you’re likely to ever encounter to the 360 viewing platform at the top. It’s not for the faint hearted/ those with a tendency to literally go weak at the knees. There is some enjoyment to be taken on the way down however as you watch fellow suffering climbers try to navigate the initial metal, vertical descent. Popular methods seemed to include the backwards bow down and the sideways squat. All very amusing. Until it’s your turn. 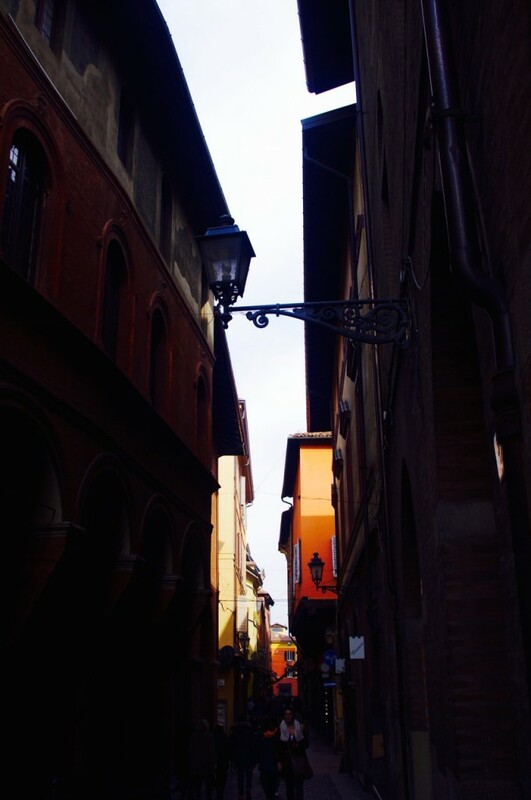 There’s plenty to be found from walking the streets of Bologna with another photo opportunity cropping up on most corners. 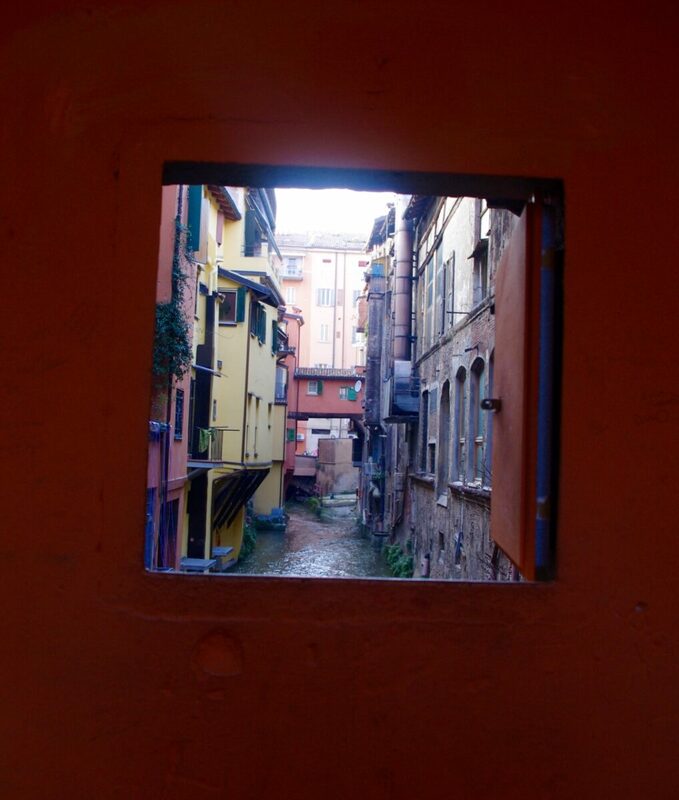 A walk up to Via Piella provides a glimpse into the hidden canals of the city, with a window to the water open for all to peer through. The Quadilatero district is home to all things produce. 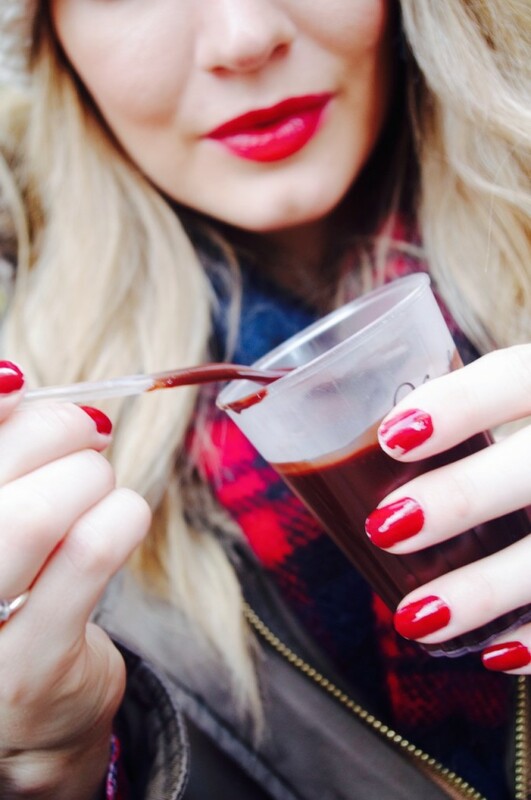 From the stalls inside the Mercato Di Mezzo to the ultimate hot chocolate from Venchi where the taps very literally bleed chocolate- it’s a food lover’s paradise. 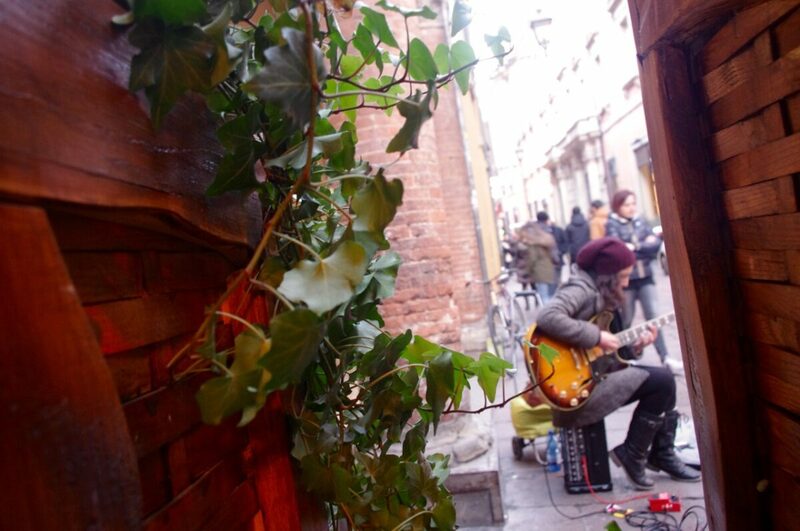 Embracing local culture, our first evening was spent sipping Lambrusco al fresco, taking in the sounds of street musicians and the rhythmic hum of Italian chatter. 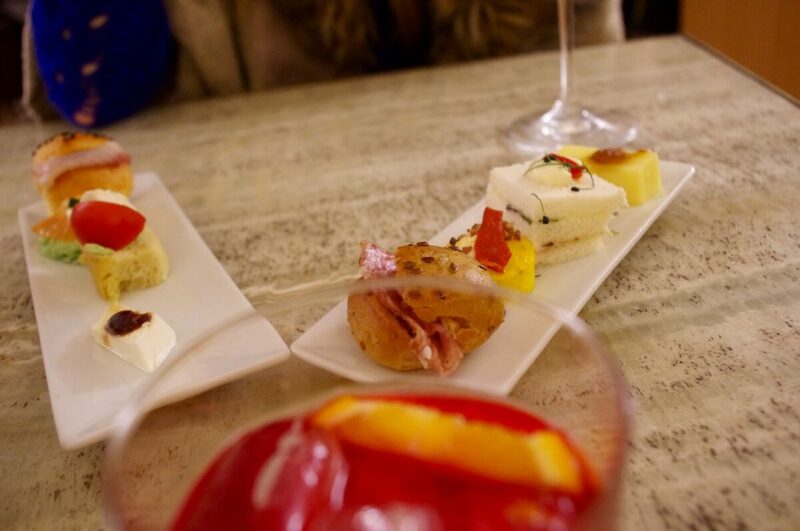 There are countless places to enjoy such an experience (we sampled several) but the best aperitivo we found was Caffe Zanarini where you pay around €8 for a drink and get unlimited plates full of delicate breads and crafted snacks to go alongside it. 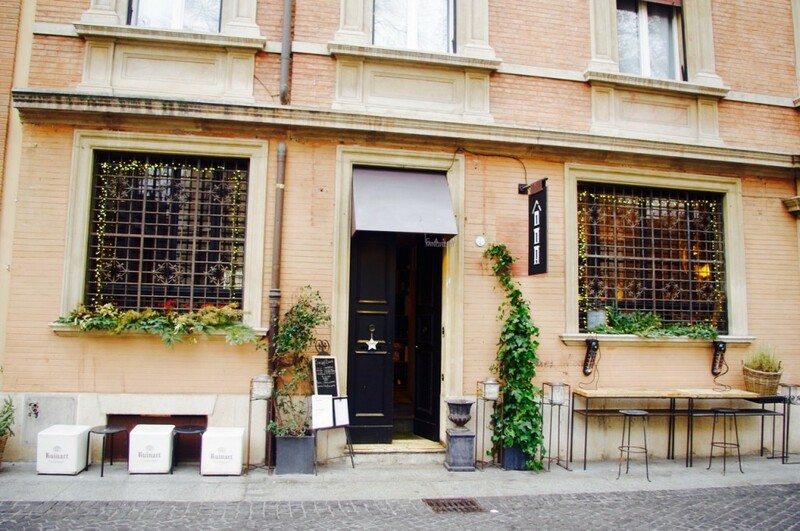 Unsurprisingly, restaurants are in abundance and we were lucky enough to be treated to an incredible meal at Osteria de Poeti which was conveniently situated several minutes away from Hotel Touring. A traditional taverna that feels every bit as authentic as it does reputable, the menu consists of Bolognese classics (no spaghetti to be seen here) as well as various grilled options. 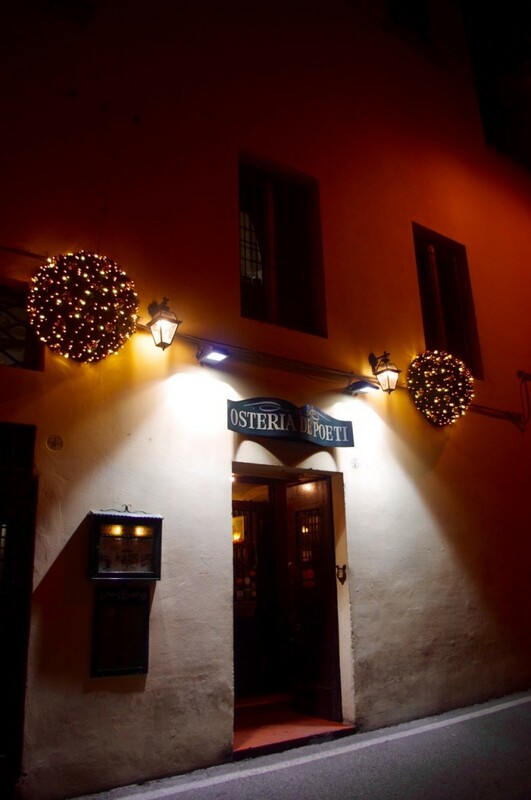 The clientele seemed very local and there was a wonderful atmosphere the evening we visited, including live music on offer in a separate dining room. 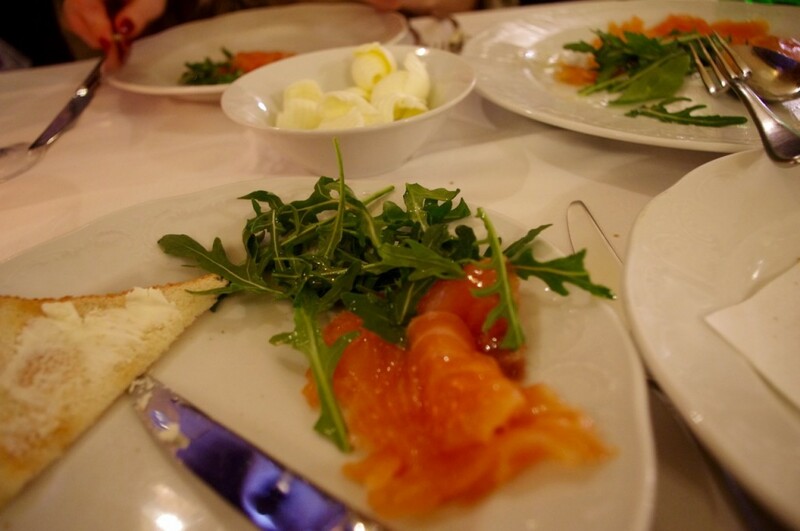 Following a plate of the meatiest cured salmon to start we devoured pasta dishes that were cooked to perfection. The risotto that was ordered next to us also looked incredible and was served straight out of an entire Parmesan Cheese. A definite serveware goal, if ever there was one. 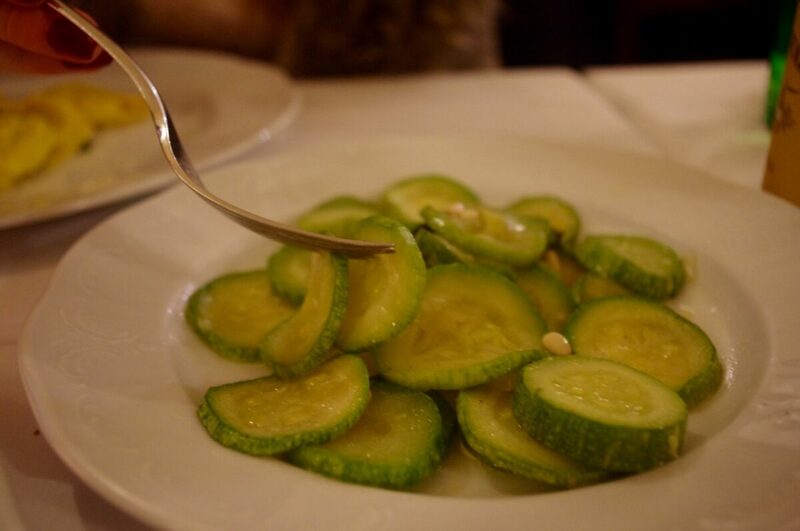 On the side we ordered the courgettes with mint and pine nuts which is probably now my favourite edible thing of the year. Yes I know we’re only a month in. 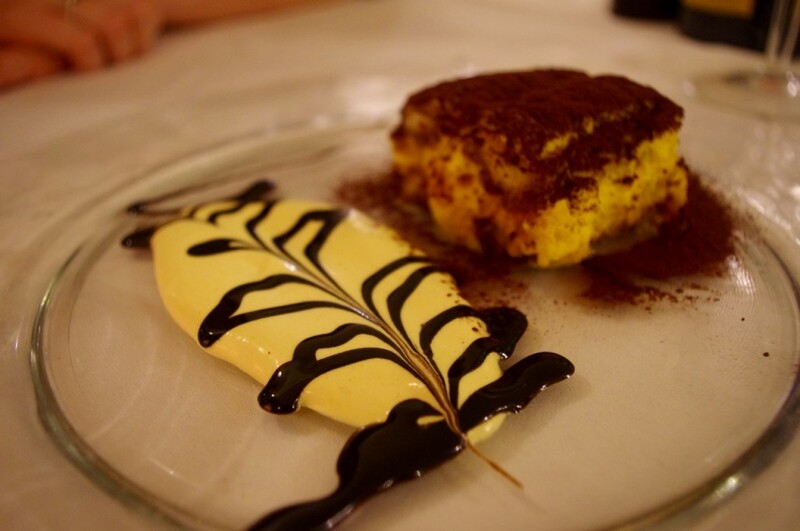 An array of desserts including the creamiest of tiramisu and freshest of fruit platters were produced alongside cappuccinos to finish. 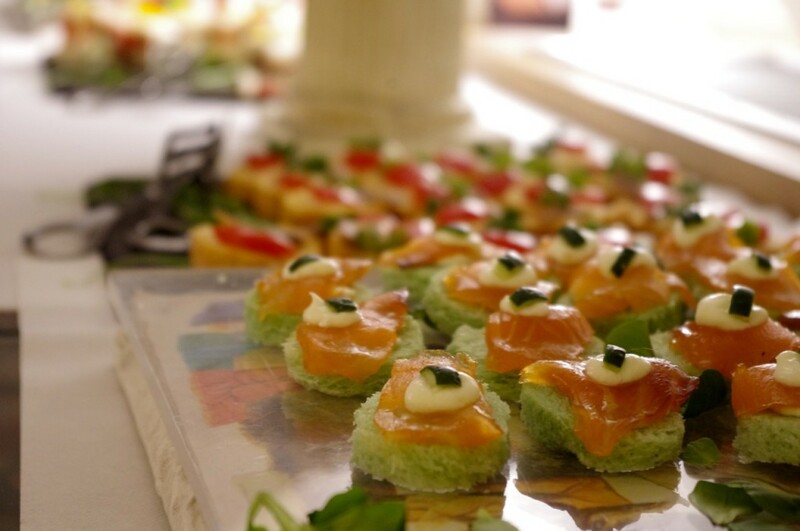 It was Italian cooking at its finest and we were expertly looked after throughout the evening. 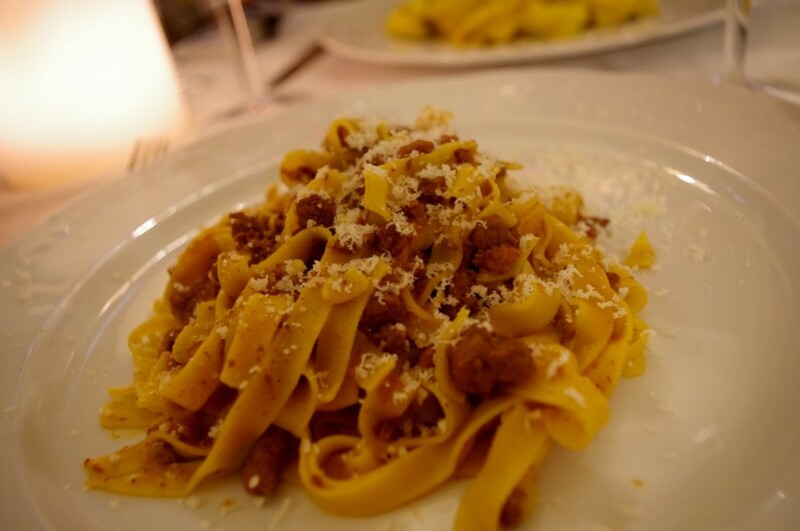 I’d definitely recommend seeking out Osteria de Poeti for an authentic Bolognese evening. 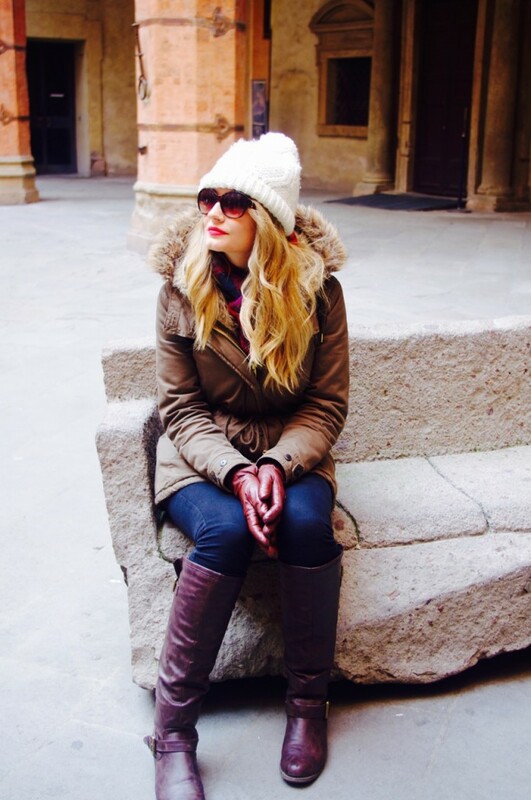 Our second day was filled with more sightseeing and seeking out food based gems. After examining some shops (all in the name of research) we walked out of the main city to find Pasta Fresca Naldi which has made it up the Trip Advisor ranks to attract crowds to its very unassuming exterior. 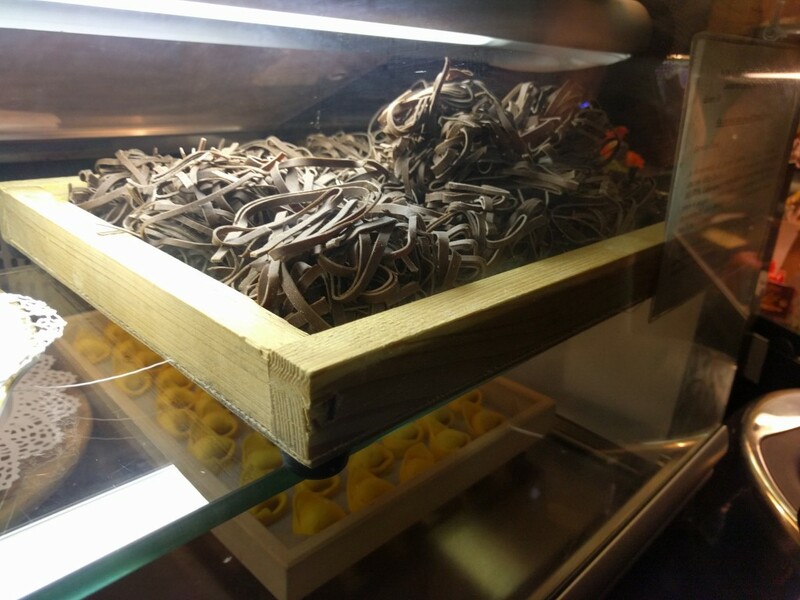 Various pasta dishes are on offer (there’s an English menu inside) and once you’ve queued up to order it’s a case of waiting patiently until it’s ready. Luckily we got one of the very few seats inside to continue our carb loading. The pomodoro tortelloni and artichoke lasagne were excellent, if somewhat un photogenic. 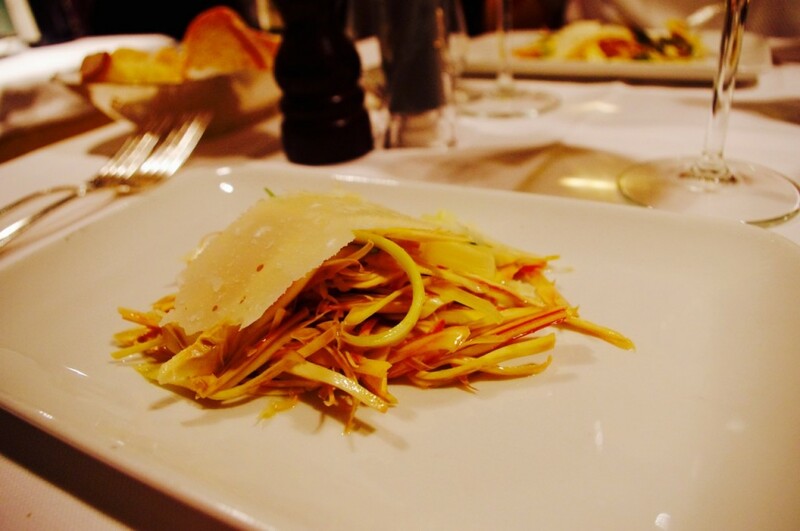 A fun and affordable alternative to the city’s central eating options. 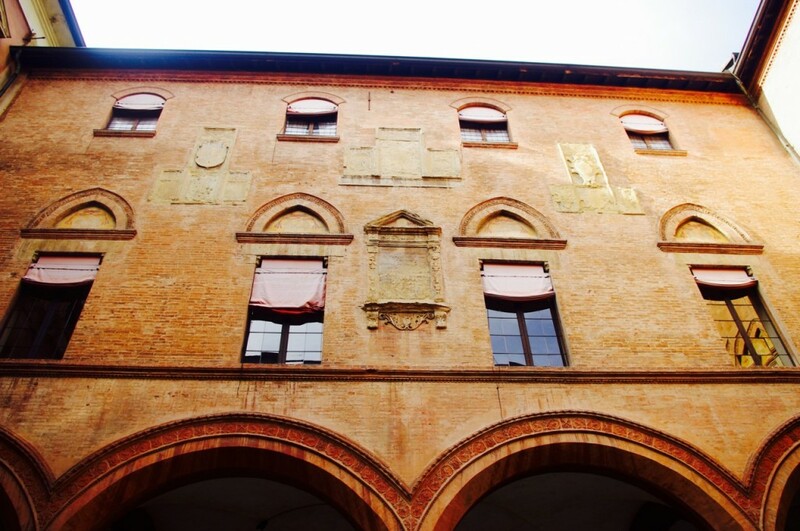 Bologna remains true to its traditional Roman roots with remnants still to be discovered in and around the city centre. 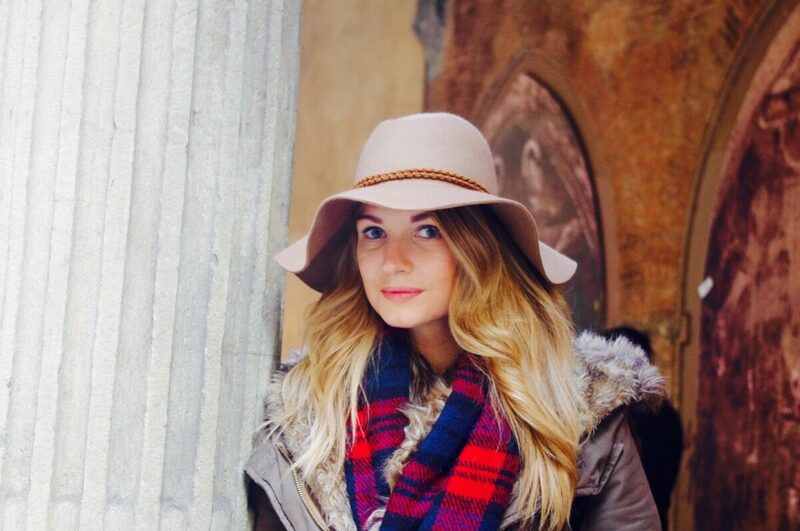 Also home to the oldest university in the western world, there’s a definite youthfulness to the city that although lively, feels far calmer than the more tourist centric Rome or Venice. The streets look largely similar as we discovered on our third or so loop of the same area. Without any real plan it made little difference to our day and we happily meandered in amongst the locals and their perfectly puffy-jacketed pets. As a small dog lover I was in heaven. As a lover of small dogs in outfits I was basically beside myself. 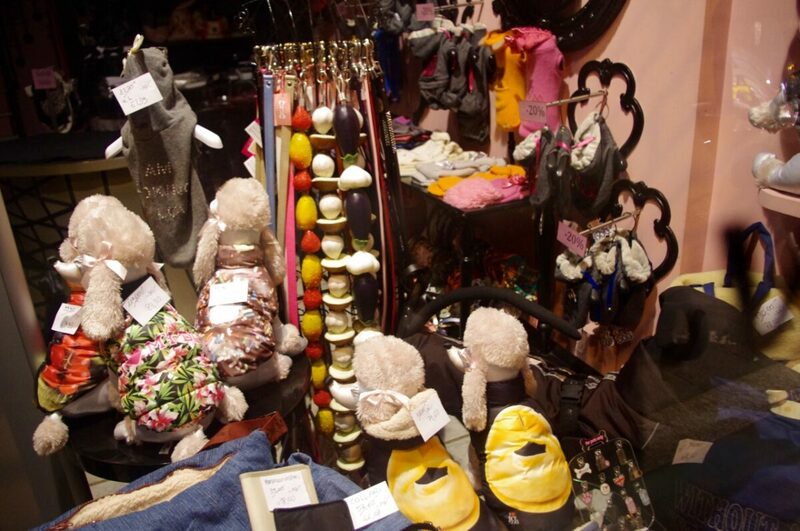 Especially when I found this shop solely designated to canine couture. Paw-fection. 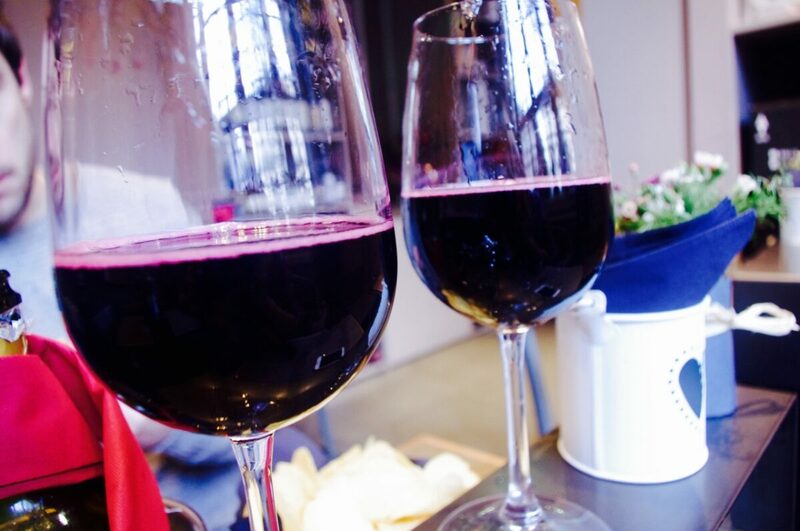 Sunday evening was spent sipping on more Lambrusco which has soon become my new favourite drink. Sparkling red wine shouldn’t work and yet here I am mourning its lack of presence in the supermarkets of London town. We found a cute spot in the form of Casa Minghetti to enjoy a reasonably priced bottle surrounded by Scandi inspired decor. 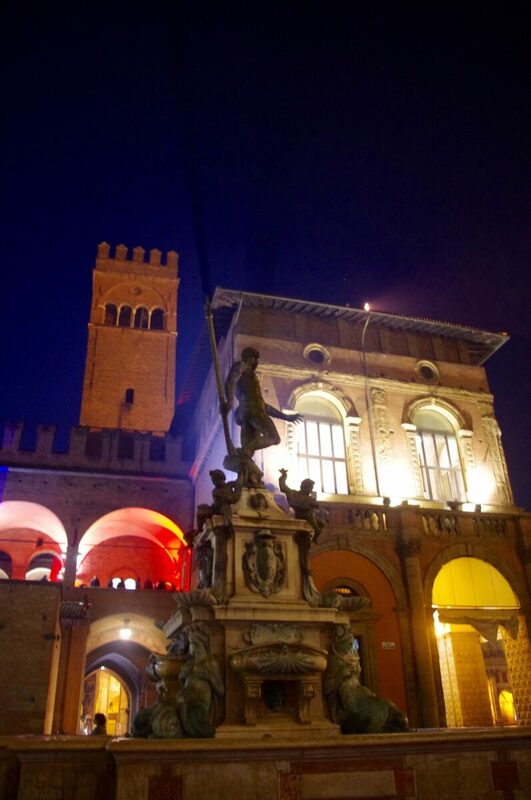 After admiring the sunset from the Hotel Touring rooftop it was off out to see Bologna after dark. 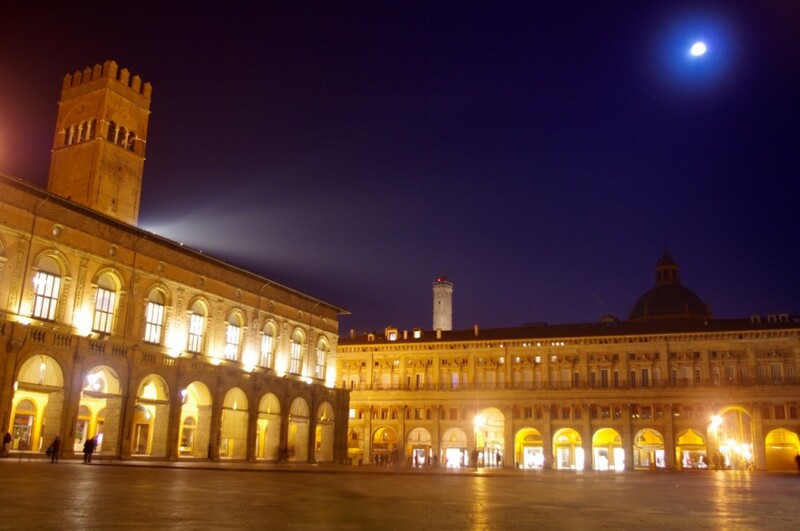 The Piazza Maggiore was beautifully illuminated and we walked under the colonades until we found Ristorante Cesarina to see out the evening. 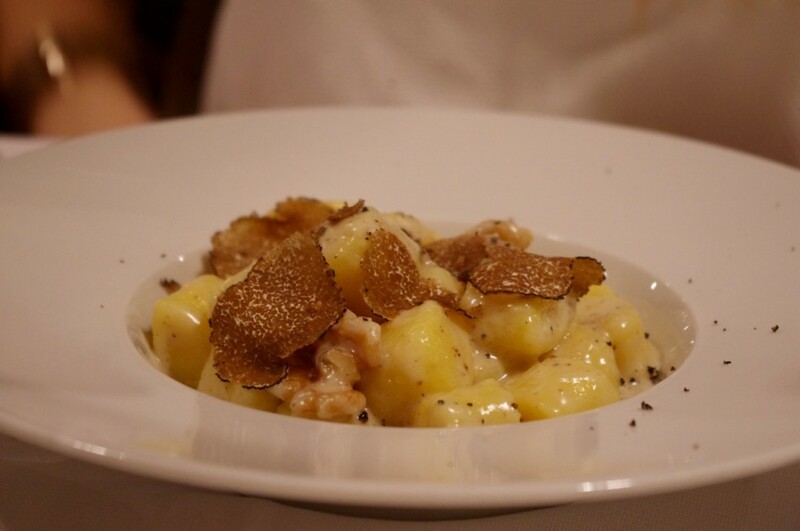 Artichoke salad…truffle gnocchi…grilled vegetables…colour me very happy indeed. Even if they did run out of fried custard balls (i.e. dessert snack of dreams) before I got a chance to consume any. Sigh. Our last day in Bologna was spent with Italian Days Food Experience where I happily found myself surrounded by €7,000,000 worth of cheese. And then by thousands of hanging pig legs. It was definitely a day to remember and very worthy of its own post. “Adventures in parmesan and pork” aka Bologna pt.2 – coming to the blog soon. 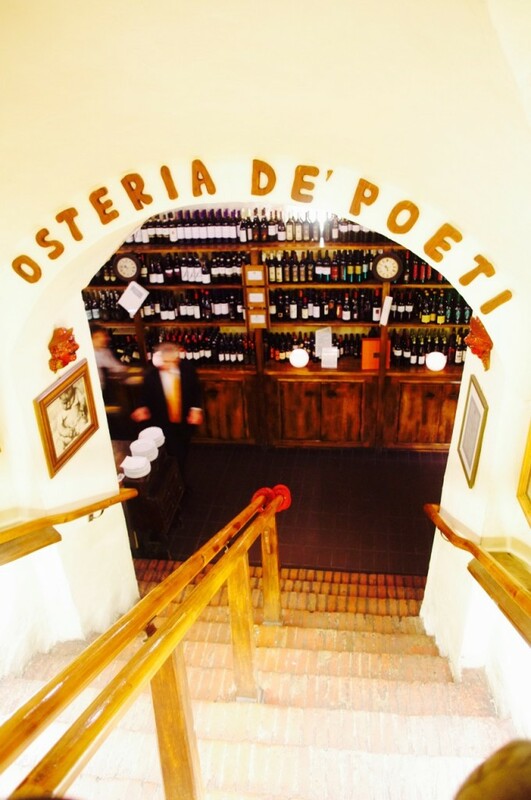 *We dined with Osteria de Poeti as part of our trip arranged by Hotel Touring. Thank you to all involved for the generous hospitality and service.